Capture the moment as well as the imagination at Mackey's Peak Villas. 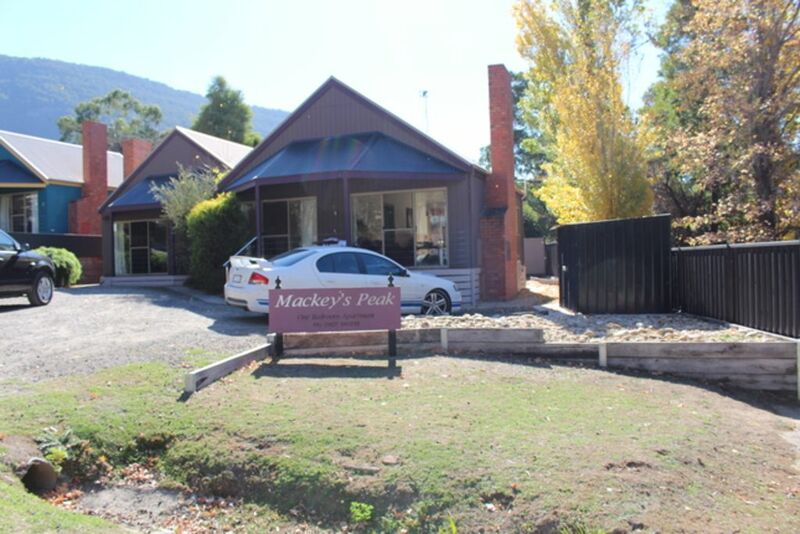 Mackey's Peak Villas are one-bedroom, self-contained villas located on secluded Rosea Street in the heart of Halls Gap. An ideal base for a romantic getaway or action-packed adventure in the beautiful Grampians. Suitable for couples, the villa is wheelchair friendly with wide doorways, entrance ramp and safety railing, has a fully equipped kitchen, newly renovated bathroom and laundry space with double spa and double shower, king size bed, open fireplace, split system air conditioning, television and Blu-ray player, private backyard, BBQ facilities, and amazing views of the surrounding mountains. Halls Gap is also renowned for hiking, rock-climbing, abseiling, canoeing, fishing, 4x4 driving, birdwatching, and it's abundance of native flora and fauna. Halls Gap is the perfect base to explore the Grampians National Park. To save $$$ contact us direct. Peaceful, tranquil and just a beautiful place to stay! Partner and I stayed here for a romantic getaway and loved the little house! Everything you needed for a romantic weekend, close to all the shops and starting points of the mountains. Can’t wait to be back! The property is well suited for 2, and is clean and cosy. From a disability perspective, it needs room for development to truly be for a person with a high level disability, now a low level disability i.e.person who can transfer from a wheelchair without a hoist into a bed or onto a toilet. is ideal. The bathroom, the toilet (a commode can go over the toilet) the shower is spacious and excellent water pressure, has a hand held hose, and also a fitted above shower head. The basin is lovely, though surrounded by a very nice cabinet. though not designed for a person in a wheelchair to wheel under. You have to access the basin side on aligned against the cabinet, it's awkward. There is no accessible rear exit door, only the front door to exit and enter from. The bedroom is spacious, though the bed wan't elevated of the ground for a hoist to go under the bed, in fairness to the owner, l didn't make mention of this request in the initial booking, and the owner did obtain bricks on New Years eve and elevated the bed, which l was greatful for, as on the first night l had to use the fold out bed stored in the cupboard, so remember to ask for the bed to be elevated if using a hoist. Grampians/Halls gap is a lovely place, Halls Gap has a very long (few kilometres) bicycle/walking path, great to drive my wheelchair along, with much shade at intervals along the way and, an abundance of birds and kangaroos roaming about. Thanks for your feedback Gregory it is much appreciated. We are in the early stages of ensuring there is facilities for high dependacy visitors to our villas and we are aware there is room for improvement. Ideally we want everyone regardless of their mobility to be able to enjoy the Grampians. We appreciated the chance to talk to you personally on how we can make it better for you and others in your situation and are in the process of implementing some of your recommendations. A wonderful time in a prime location. Overall the facility was great for the two of us. Loved the location as it was close to everything. Enjoyed the kangaroos on the lawn next door! Excellent location and very comfortable. Only problem was it smelled quite a bit of smoke, and difficult ot air in cool wet weather. This property has a brilliant location, just a few minutes walk from the centre of Halls Gap. I've stayed in a few similar places in Halls Gap, and what makes this one stand out is the bathroom - it's great! Overall a very comfortable place to stay.